Jack with his wife Lesley Thornley, Cllr's George Alexander and Derek Ross. The local authority needs to make £14 million worth of savings over the next two years if it is to stay financially solvent. Chiefs recently announced budget cuts they hope will result in more than £5 million of savings in the next financial year. They include reducing library opening hours and closing Elgin Community Centre, Cooper Park Bowling Pavilion and the Falconer Museum. As part of the process, the council is seeking community engagement with local people about the various money-saving proposals. At the first in a series of meetings yesterday, the main topic of discussion was the effect these cuts could have on tourism in the area. Aberlour forms part of the Speyside Malt Whisky Trail and the town attracts over 6,000 visitors every year. One concerned local, Jack Thornley, a retired offshore worker in his 80s from Craigellachie, said he felt “strongly” about the proposal to reduce grass-cutting on rural pathways. He said: “I’m most worried about the effect on tourism as they want to reduce the grass-cutting on the Speyside Way. Moray Speyside Tourism operations manager Laurie Piper also called on the council to protect the tourism in the area. 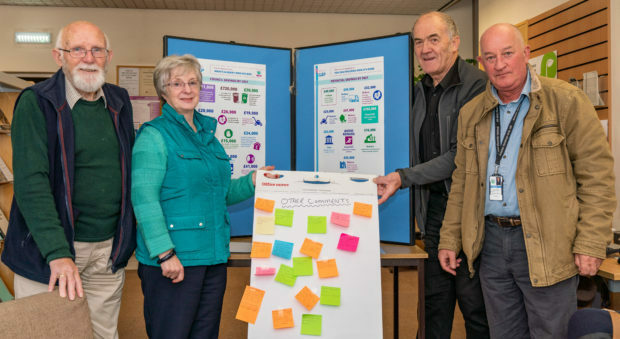 Local councillors George Alexander and Derek Ross also attended the consultations to listen to the concerns of local people. Both have plans to make an appearance at every one of the seven drop-in sessions. He said: “It’s extremely important to gather the opinions of people like Jack and others. Buckie library will be the venue for today’s public consultation, which runs from 10am until 7pm. Among those who attended the consultation were husband and wife Jack and Lesley Thornley. They are both concerned about proposals to reduce the grass-cutting services at key spots, such as the Speyside Way. Mr Thornley, from Craigellachie, said: “I’m most worried about the effect on tourism. “They want to cut the grass cutting back on the Speyside Way which means it will get overgrown. I suggested that they do it two times a year instead of five. I’ve made suggestions about when it should be done. The retired offshore worker, who is in his 80s, pointed to the recent closure of the public toilets in Craigellachie as another drawback for visitors. Mrs Thornley, a retired support worker, also stressed the important of regular crass cutting at the Speyside Way and cemeteries was still important. She said: “Apparently the old cemeteries are being cut 15 times a year they are now going to make it twice a year. Speyside and Glenlivet councillor Derek Ross said the council were between “a rock and a hard place” when it came to the budget cuts. He said: “Well I think it is important that we consult but it is also important for people to understand that Moray Council is between a rock and a hard place in a situation where we get underfunded from the government.